Ok, I was bored, brain overload from viewing images on the monitor. 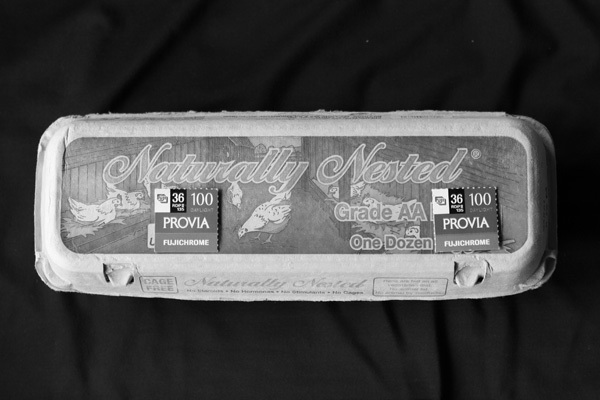 So I decided to have some fun with the camera and test the settings in a series of images of an idea I had about to throw away an empty egg carton. It's was a "Hmmm..." moment. Ok, it's not that cute or funny, but hey, it's something. And you thought film was dead. It's been reinvented and hatched anew, available at all fine film grocery stores. Ok, on to the test. I set the egg carton parallel to the window with the overcast sky in the late morning so the light was uniform. It was placed on a pure white background to ensure an even background when testing the different metering. All the images were taken at 100 ISO and f5.6 shutter speed which varied from about 1/15th to 1/50th of a secnd. All images were capture in raw format, converted to 400x600 pixel jpgs with no adjustments with Adbobe Bridge and Photoshop in CS2. The adjusted parameters were white balance - automatic, daylight, shade and cloudy, metering - spot, center weighted, partial, and evaluative, and picture style - standard, portrait, landscape, neutral and faithful. Five sets of images in raw format were taken were for each of the five picture style at the four different white balance	through the four different metering. This isn't any real test with details and analysis, but a general one to get a feeling of the different settings. Monochrome was added for the last set to get the above images and some additional testing for my own interest. The next two Web page presents the images for the color balance test images and the picture style test images, and results Web page gives my general results, some of which I think changes the	idea the raw format is the original.